In the spring of 2017, Queen Books opened its doors in Toronto’s Leslieville community. Since day one, co-owners and first time entrepreneurs Alex Snider and Liz Burns have developed and implemented a business strategy that reflects community engagement and effective inclusivity. Not only are they selling books, but Alex and Liz are curating and sourcing product and content that appeal to diverse Leslieville readers, as well. Further, these Torontonians are giving locals the independent bookstore to which they hadn’t previously had access, while hosting events, fundraisers and in-store readings that support multiple diverse communities and organizations across the city. Queen Books. Photo by: Eric Putzer. 1. What were those first few, “We’re Open,” days like, for you? Oh, it was magical! A bit of a blur and completely surreal but it will go down as one of the best times of my life. Also, Liz went into labour and her son was born the day after we opened, so it was truly an extremely memorable weekend, all around! 2. While preparing for opening, you posted progress updates on your Instagram. How do you think this strategy impacted your current customer base? We were able to really generate a lot of excitement, both in the immediate neighbourhood and in the overall Toronto book community. It had been several years since a general interest independent bookstore had opened, and after so many indies closed over the last decade or so, people were really happy to see us open. 3. Why was Leslieville in the cards for Queen Books? Liz and I both moved to Leslieville around the same time in 2015 and immediately fell in love with the neighbourhood and strength of the community, but there wasn’t a bookstore! 4. Over the last year or so, how has Queen Books molded and developed to further become a part of the Leslieville neighbourhood? The community has really rallied around us and accepted us in a way that we weren’t expecting to happen quite so quickly. We naturally have become a part of the community. We believe strongly in community building, so we have responded to that with lots of events geared towards our customers and neighbours, and have, from the beginning, made certain that the books we stock are representative of the community and their tastes. 5. Had you always known you wanted to open a local bookstore? What compelled you to turn dream into reality? Yes! For Liz it was a more concrete, life-long goal and I just dreamed of it. Then we met and suddenly all the stars aligned. We found the perfect neighbourhood, then the perfect space. We met working at another indie bookstore. It was basically just the two of us and so we spent tons of time together and hit it off as friends and co-workers. 7. What has been the best part about co-owning a shop together? We have similar sensibilities but have different strengths, so we really compliment each other without stepping on toes. It’s also really nice having a friend who always understands exactly what you’re dealing with at work. Plus, we honestly love what we do and we have so much fun together. 8. What has been the most challenging aspect of the journey, so far? That’s a tough question! On the one hand, it’s all been challenging. No amount of other bookstore experience could have really prepared me for actually running a business of this size and scope. On the other, I’ve enjoyed it all and it’s been fairly smooth so far. So, calling it a challenge doesn’t seem to fit with my experience. 9. How many people do you have on the Queen Books team? How was your experience with hiring staff, after day one on the block? We have six people on our team including our first hire, Jackie, who is now our Manager and Events Coordinator. We’ve been extraordinarily fortunate with our hires. Everyone works so well together and each brings such important and unique skills to the store. They’re all incredible readers and booksellers and among the best people I know! 10. In addition to selling books and as you mentioned earlier, Queen Books also supports community organizations and artists through events, awareness and other initiatives. What was the first event you hosted? How was it received? About two weeks after we opened, we hosted an Authors for Indies event with something like 11 different authors who came in to do readings throughout the day. It was super busy! Looking back, I don’t know how we did it! Alex Snider, Co-Owner of Queen Books. Photo by: Eric Putzer. 11. How often would you say you host events in-store? We do a storytime event every weekend and beyond that, usually we have about three to four other in-store events each month. During a busier month, however, we will see around three to four events each week. 12. How would you describe the environment in the room when hosting a reading or launch? 13. You’ve also hosted Fay & Fluffy’s Storytime, a duo of Toronto drag artists sharing their love of reading with kids. Why is it important for Queen Books to incorporate support for the LGBTQ2S+ community into your mandate and into the daily happenings of your store? Why is it significant for you to act on supporting diverse communities, as opposed to meeting the recommended quota of inclusion and diversity in the workplace? Yes! We love Fay and Fluffy. It’s always been important to us to support and represent diverse communities because they are so often neglected in mainstream literature, and our culture at large. There has been some fantastic progress and conversations happening, but we think it’s important to showcase LGBTQ2S+ voices and recognize that there is still so much societal messaging that is really harmful. Storytelling is an amazing way to foster empathy and understanding. From the beginning, it’s always been important for us to reflect our customers’ lives and experiences. 14. When Fay and Fluffy are in store, how do audiences engage and interact with them? What do you think these engagements can teach the world about how we view gender identity as a social construct? Kids are both transfixed and inspired by Fay and Fluffy. The two artists are childcare professionals and incredible performers, and they are so fun with the kids. They have songs, great book choices and jokes for the adults in the crowd. We think these engagements teach kids to view gender as more fluid than many of us have been taught. Fay and Fluffy are so great at answering kids’ questions, and so many kids don’t have preconceived notions about gender until someone tells them. So having folks like Fay and Fluffy do the work they do, it gives kids (and adults) language and examples to express themselves authentically. 15. Have you ever faced negative criticism about events like Fay & Fluffy’s Storytime or other inclusive initiatives you support? If yes, how did you respond and what do you hope critics have learned? We haven’t faced any negative push-back! If we ever do, we will be polite but very firm in our continued mandate of inclusivity. 16. If there is one thing your customers take away from an experience at Queen Books, what do you hope it is? Ultimately, we want to connect people with books that they’ll love! We don’t want anyone to ever leave the shop feeling judged or bad about their taste in books, instead we want to spread the joy of books. 17. There is an interesting shift happening right now in the world of books. There is the convenience of ordering online, of course, but more and more people seem to be gravitating towards going into their local shops to get their reads, supporting entrepreneurs, artists and writers. The conversation on social media in the realm of publishing and creating also seems to reflect this. Would you agree? How has this apparent shift impacted Queen Books? We would definitely agree. 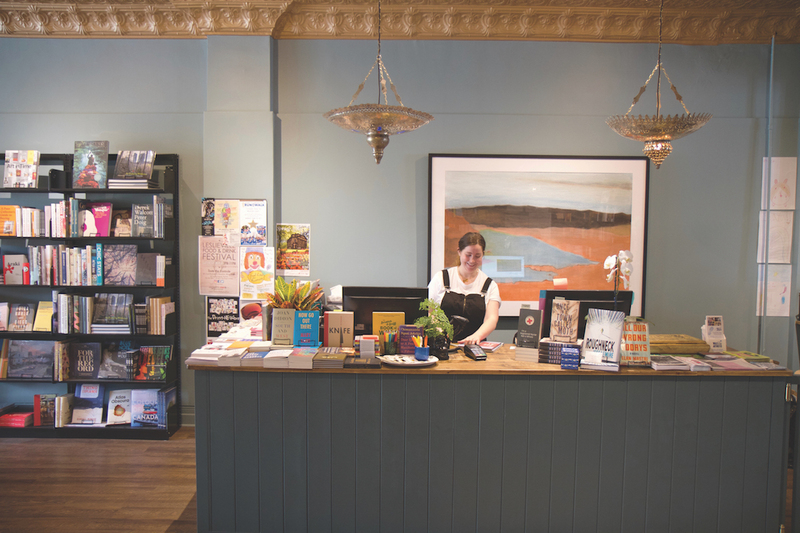 We’re lucky to have set up shop in a neighbourhood of people who love books and love shopping local. After so many years where there was a real shortage of indie bookstores, I think people miss the recommendations and the space local bookstores create in a community. There is something about going into an independent bookstore that gives you an experience you can’t have online. From conversations we’ve had, it seems many of our customers use both, but typically ask if we can special order or put books on hold for them before looking online. 18. What were your favourite reads of 2018? Heartbreaker by Claudia Dey, In the Distance by Hernan Diaz, Milkman by Anna Burns, Severance by Ling Ma, Florida by Lauren Groff, I’m Afraid of Men by Vivek Shraya and America is Not the Heart by Elaine Castillo. 19. How has the Queen Books brand shifted and changed since you opened your doors in early 2017? I’m not sure that it’s changed at all, maybe just become more itself! 20. What does 2019 have in store for Queen Books? What are you most excited about? I’m excited for some of the events that we’re working on – stay tuned! And, to see how our year two is! 21. Do you have anything else to add? Thank you Alex for sharing your story with us and for encouraging folks of all ages, experiences and identifications to create and consume content that matters, while also supporting local. Readers: for more information about Queen Books, visit their website at queenbooks.ca. Follow all of Alex and Liz’s adventures on social media, too. They’re @queenbooksTO on Instagram, Facebook and Twitter. The feature photo is by Eric Putzer.